My mattress is much older than I care to admit. We tried a new mattress, but ended up using it as a guest bed. We like our mattress because it is fairly firm, which works well for us better than a softer mattress. The only problem, though, is that with firmer mattress, although it resists sagging, it can be uncomfortable too. 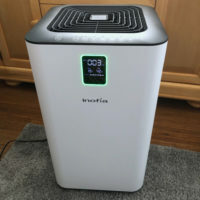 By the time the morning rolls around, I can feel discomfort where I have laid on my hip and shoulder, plus I can feel lumps or bumps in the mattress. The Mellanni Microplush Mattress Pad offers both comfort and protection, and is a great addition to our bed. I have not tried a mattress pad that was plush like this before. We have only used very thin mattress protectors. I got this Mellanni mattress pad for my Queen size mattress, and it was very easy to put on the bed. The pockets are nice and deep and this easily stretches over our mattress. I get frustrated having to struggle with bedding, so I appreciate how easy it is to use this product. 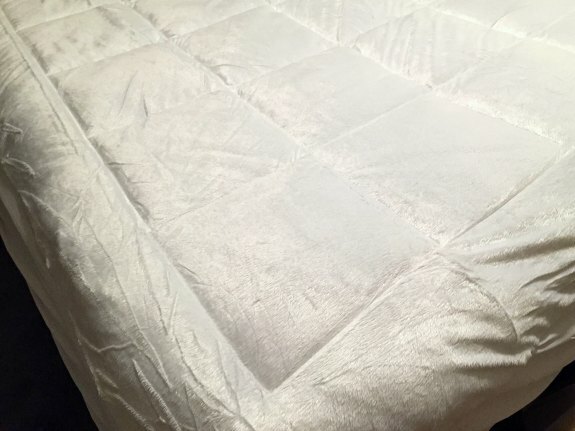 The Mellanni Matress Pad has a polyester fiber content makes it easy to wash and hold up. I prefer synthetic over down feathers when it comes to bedding for washability, and more humane. The topper is stitched in squares, which is a nice feature to help keep the filling evenly distributed (instead of bunched up at one end, etc). This also serves to both protect the mattress and to buffer us from allergens. The mattress pad feels very plush to the hand. I don’t know thick it feels when I lay on it, but I think it helps make the mattress feel smoother and softer.